The Wordless and Almost Wordless Wednesday Blog Hop | Happy First Day Of Summer! | Focused on the Magic : The Wordless and Almost Wordless Wednesday Blog Hop | Happy First Day Of Summer! The Wordless and Almost Wordless Wednesday Blog Hop | Happy First Day Of Summer! This is the latest edition of The Wordless and Almost Wordless Wednesday Blog Hop here at Focused on the Magic.com where each week we get together to blog hop, link up and share our #DisneySide Wordless Wednesday or Almost Wordless Wednesday, Disney related picture posts. Happy first day of summer! Also known as the summer solstice, or the longest day of the year and the official start of summer for those of us in the Northern Hemisphere. The theme or topic of this week's hop is Summertime. In summers past I've been to Stonehenge, enjoyed the beaches of the Hamptons and Jersey Shore, boating on Great South Bay, the Long Island Sound and Jersey waters, lounging around the pool, camping, road trips, cruises, the annual balloon festival and flights to exotic and not so exotic locations. Always accompanied by lots of food, family, and fun. The most family fun trips hands down have been at Disney World and on Disney Cruises. Summer time at the Disney Parks is hot, hot, hot! I decided to share a few of my favorite ways we stay cool besides drinking copious amounts of water whilst spritzing ourselves with misters, hopping from shop to shop, attraction to attraction based on the air conditioning, and swimming after hours. 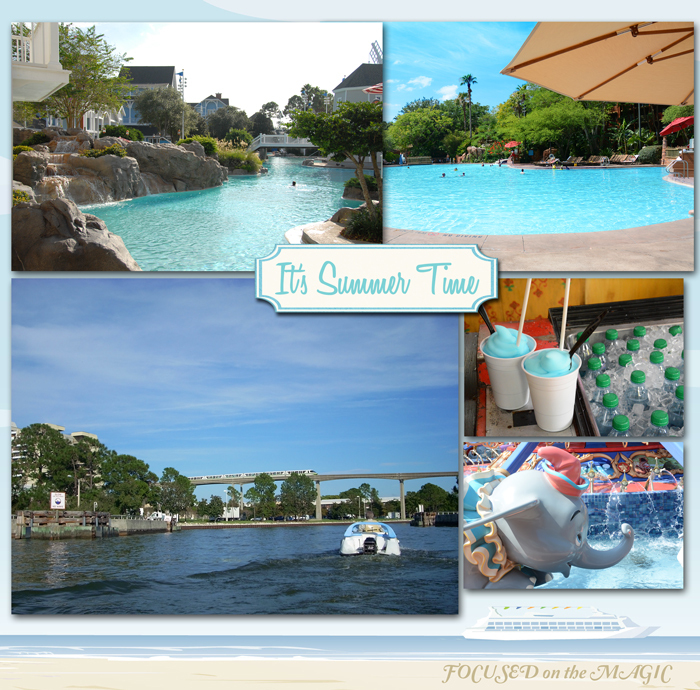 Who doesn't love The Yacht & Beach Club and Animal Kingdom Lodge pools to swim away the heat? Or zipping around on water mice by the Contemporary and Wilderness Lodge. And a cool frosty Blue Raspberry Goofy Glacier at Animal Kingdom. Don't forget to join the Instagram photo challenge. Tag your IG pics with #disneyphotohop. Ready for more photo fun? Tag your WW photos on Instagram with #DisneyPhotoHop or #WWphotohop if it's not Disney related.